Are you traveling to Boston soon? Are you looking for some tips to get the most of your stay and budget? 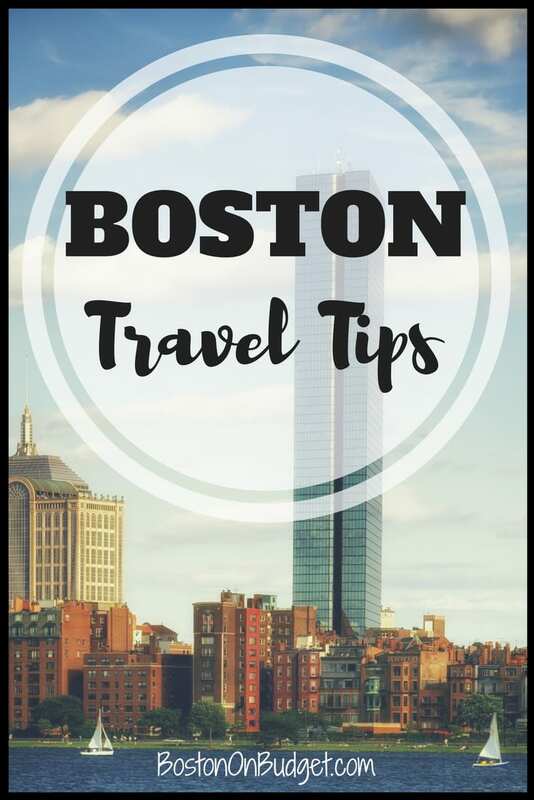 Below you’ll find a round up of Boston travel tips geared to first-time and repeat visitors to help you easily plan your Boston vacation. Hope you have a great (and affordable) trip to Boston! Please note that some links and information below may be affiliate links to help support the blog and you can read my disclosure policy here if you have any questions. Ok, lets get on the same page. Boston is expensive. Boston hotels are expensive. And staying outside the city usually doesn’t save you much money when you factor in the cost of travel and your time. If you ever read any “Most Expensive Cities to Visit” or “Cities with the Most Expensive Hotel Rates”, you’ll usually find Boston on the top of those lists– even worldwide lists too! I think at one point, Boston was the most expensive city for AirBnB bookings. You’ll be happy to know they dropped down a few spots to the #6 ranking for AirBnB, but still…. Just because hotel prices are more expensive than other cities, doesn’t mean you shouldn’t come visit (because you should) and doesn’t mean you can’t get a great deal, because you can– please just be realistic before budgeting $100-150/night, unless your willing to stay in a hostel or rent a room through AirBnB. So where should you stay in Boston and how do you find a hotel to fit your budget? I’ve got all the details and breakdown in Where to Stay in Boston on a Budget, but here’s the quick breakdown. Hotel prices vary A LOT, even from day to day. If you have flexibility, I’d play around with your dates to see if there’s a big difference in hotel rates. The most expensive hotel rates are typically in mid-May (college graduation season) and September and October (Conferences and Foliage). You’ll typically find the best rates in the winter months when it’s chilly, but not always, so make sure to play around with your dates if you have some flexibility. Boston hosts a lot of conferences, so if there’s a big conference leaving the city before another big one arrives, you may find a sweet spot in rates. Typically, you’ll want to check boutique hotels for weekday trips and conference hotels for weekend visits for the best rates. Trivago: Trivago compares prices from many different websites and finds the lowest price available. This is a great way to find low hotel prices from great hotels without looking at many different sources. Trivago is a great first website to check out to get a good sense of different hotel prices and what the different rates through different websites may be. Booking.com: If you are looking to stay in the city and don’t want to be teased with suburban prices, Booking.com does a pretty good job with listing hotels actually in the city and they have a great map view feature too. They also include Boston hostels like 40 Berkeley, HI-Boston Hostel, and smaller properties in their search and will make helpful notes like “breakfast included” on the search page too. Expedia: Expedia is an easy to use website and offers competitive rates. They also offer bundles if you are looking to book a rental car, flight and more to help save even more money. Hotels.com: Hotels.com is also another easy to use booking website that shows a good range of hotels with different sorting options. Also, they often have % discounts and will nicely list the promo code above a participating hotel and you just need to enter the promo code at checkout to get the extra discount. Hotels.com also has their own loyalty program if you book hotels through them often. Priceline: Priceline is a great option if you just need a place to sleep at night. You can book regularly through Priceline, use Express deals, or name your own price to save the most money. Keep in mind it is impossible to get your money back if you are not happy with a secret hotel you receive so make certain you are okay with the mystery format beforehand. You can also check out sites like betterbidding.com to help figure out what hotel you’re most likely to get if you name your own price. Priceline is a great option if you have a tight budget and don’t have any specific hotel needs beyond price and star quality. Last Minute Travel: Don’t let the name fool you– this is a great website for booking hotels far in advance too. Last Minute Travel works similar to Priceline where you don’t know the hotel before booking but you do get a better price because of the instant commitment. The nice thing about LMT is if you scroll through the pictures of the hotel, you can usually figure out the hotel you will get before you commit. The hotel pictures on LMT will usually show the hotel name in the lobby or through a quick google search with the information provided on the site. This is a great option for those who don’t want to pay full-price for a hotel room and don’t want to give up complete control to Priceline. Hotels Tonight: Download the Hotels Tonight app right on your phone to get deals on hotels for that night as well as hotels up to 100 days before your stay. Even better, new users can use my referral code KAJORDAN39 for a free $25 credit on your first booking! VRBO: Rent a house instead of booking a hotel. This is a great option for families who need a little more space as well as people who are staying for longer visits to Boston and would like a kitchen and the comforts of home. HomeAway: Homeaway is very similar to VRBO for house rentals; however, usually different properties are listed so it’s great to check out both options if you are looking for a house rental instead of a traditional hotel. Couchsurfing: Not for everyone, and please use caution– but couch surfing connects visitors to free couches to sleep on during your visit. There are also a lot of other booking websites to check out so don’t feel discouraged if you can’t find something in your price range. You can always book a cancelable hotel room if you want something booked for peace of mind and keep checking prices for lower room rates closer to your visit to see if prices drop more. Where Should I Stay in Boston? It’s not to say that you shouldn’t stay in spots outside the map above, it’s just that all the areas above are nice and most are walking distance to attractions you’ll want to visit. However, the areas in the map are typically the most desirable– and most expensive too. There are also spots in Charlestown, Cambridge, South End and more that you may want to include in your hotel search that are not shown on the map above if you’d like to have a bigger area to search for– just make sure there’s good access to the T.
A lot of people think that staying outside the city (in the Boston suburbs) is the way to go for saving money on hotel costs. It can be, but it can cost just as much to stay outside the city when you factor in parking, gas, MBTA tickets, and most importantly– your time. Most places outside the city will take AT LEAST 40 minutes whether you travel by train or car, and can be more depending on location and traffic. This can cut into some valuable vacation time so keep that mind. If you are considering staying outside the city, make sure to scroll down to read about Boston Transportation options and the cost of traveling to the city. (Spoiler: You won’t want to rent a car). If you do want to stay outside the city or at least do a cost comparison, let me help. A lot of people want to stay outside the city at a nice hotel that has free breakfast, free parking, and walking distance to the MBTA. I can’t think of any. Hotel Indigo in Newton is right next to the Riverside T Station (last stop on the Green Line), but still may be out of budget range and doesn’t include breakfast, I don’t believe. Most suburban hotels closest to the city usually still charge (a smaller) parking fee and/or don’t include breakfast and suburban hotels further from the city are not walking distance to a T. Keep in mind you’ll need to pay for parking at a MBTA garage (usually around $5-10 a day) and CharlieTicket ($5.50 per person roundtrip) or you’ll need to pay for gas and parking if you drive directly into the city (usually $30-40 a day for downtown parking). For two people to take the T in every day from a local station like Alewife or Quincy Adams, it would be $18 a day just for parking and the train ticket. It would obviously be more for a family, although children 11 and under ride free with a paying adult. Not to mention the cost of gas, car rental, and most importantly, the cost of your precious vacation time. However, if you plan on doing more day trips from Boston or hotel prices are really expensive during your visit, staying in the Boston suburbs may work perfectly for you– just make sure to do the math before you decide. It is not recommended to have a car in the city. You do not need one and you probably don’t want one. Boston is an old city where streets were built around houses, so sometimes the streets can be hard to navigate as well as a number of one way streets as well. Also, sometimes GPS doesn’t work the greatest, so Boston can be a little hard to navigate by car. If you are flying into Boston, I’d recommend staying downtown and walking and taking the T everywhere. 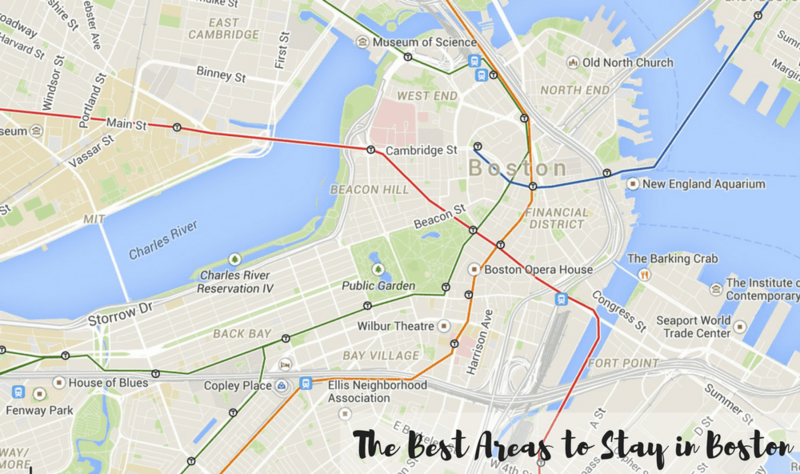 Boston is a walking city and is fairly small as easy to navigate on foot or by train. A car isn’t necessary in Boston. Parking in the city will cost you $40+ a day, and more if you are staying overnight, depending on the area. If you are flying into the city and are looking to do day trips to Cape Cod, Newport, Plymouth, Salem (you can take a ferry here though), Lexington/Concord, Maine, etc., you may want to book the car for the day of your trip and return it that evening when possible. Car rentals are usually cheaper in the city than in the airport anyway. Zipcar: Car sharing with pick up and drop off availability all through the city and rental opportunity from 1 hours to 7 days. New Zipcar members can also receive a free $25 credit. You can also use search engines like Expedia or Orbitz to help find the lowest price as they search through multiple car rental companies for your dates. Keep in mind that parking can be expensive if you do decide to rent a car and park in the city. The Boston Common parking garage is a popular parking garage in the city with plenty of spots underneath Boston Common and is in a central location. However, there are many other options in different locations and cheaper in price. There are also a few parking apps that you can download that will tell you the current price of available parking garages in the area. This is a great way to find a parking garage at the best available price without driving all around the city. Metered parking is also an option, although it can be tricky to find a spot. Time limit in most areas are 2 hours and are strictly enforced. This is a great option if you want to park quickly in an area but not a good all-day option. Parking meters can be hard to get too, especially on Sundays, holidays, and after 8PM when meters are free. Meter prices, hours, and more will depend on the neighborhood but you may want to download the Park Boston app where you can pay for parking right on your phone in select metered areas. However, Boston is an easy city to navigate without a car, and you may want too. The MBTA or the “T’ is Boston’s subway system that runs through the city. You can find the subway map and schedule here. Trains typically run every 5-15 minutes with more trains during peak rush hours. Fare for the subway is $2.25 per ride with a CharlieCard and $2.75 per ride with a CharlieTicket. Children 11 and under ride free when accompanied by an adult. A CharlieTicket can be purchased at a self-service kiosk at the station and will be a paper ticket. It’s better to type in the exact amount you need for a ride (or two or three) with the CharlieTicket because some of the amount suggestions don’t make much sense. You can use a CharlieTicket more than once if you do add enough for a roundtrip ticket or two. However, a CharlieCard is a plastic, reusable card that you can add money too at the kiosks and it’s a physical card instead of a paper ticket. A CharlieCard is great to have if you live/work or frequent the city often, especially since it saves you .50 per ride. A CharlieCard can be found at major stations (like South Station) or you can ask a station attendant if they have an extra one if you plan to ride the T often during your visit. If you are visiting the city, you may want to consider a 1-day or 7-day pass. A 1-day pass is $12 and a 7-day pass is $21.75 and includes unlimited subway and bus rides. However, keep in mind that Boston is a walking city and a lot of tourist attractions are close together so you may want to walk than figure out the subway system, especially if the weather is nice. However, the 1-day or 7-day pass may be a good option if you plan to take the subway a lot to get around the city. For more information, rates, schedules, and more regarding the MBTA, please head here. If you are arriving from Boston Logan Airport and plan to take the MBTA (Silver Line) to your destination, don’t worry about figuring out fare until your next trip. The MBTA is FREE for trips leaving Boston Logan Airport terminals via the MBTA Silver Line. The Silver Line will also connect to other lines and you won’t need to pay again until you leave the station. You will need to pay if you are heading to Logan Airport, but trips leaving from the airport are free thanks to MassDot. For more information about free T rides from the airport, please head here. It’s a nice welcome to Boston, don’t you think? If you are traveling to the Back Bay to/from the Airport, you may want to consider the Back Bay Logan Express as a T alternative. A one-way fare is $7.50 or $3 if you have a valid MBTA pass. Credit/debit card is only accepted. For more information about this shuttle to the airport from the Back Bay, please head here. You can also park in the suburbs of Boston for $7 and then take the Logan Express to/from the airport. For more information, schedule or rates, please head here. In addition to regular taxis, Boston also has some ride sharing options with Uber, Lyft, and Fasten in the city. Keep in mind that prices may vary, and some ride sharing companies do charge a surge charge when rides are in demand. However, you can easily hail a ride and pay right through your phone which is nice. There’s also the bus, commuter rail, and ferry if you are looking for more ways to get around the city without a car and more information about those options can be found here. The Freedom Trail is my #1 recommendation of things to see in Boston on vacation and many of the stops are free and all others are pretty affordable as well. Print out a free map of the Freedom Trail and follow along the red painted brick on streets in Boston. Note that a few historical places close around 4-5PM, so plan accordingly. You can start at any point and chances are you’ll end up on the Freedom Trail a few times during your visit without trying. You can also pay for a guided tour, but doing a self-guided tour at your own pace is fun and free. A (bus) tour is a great way to see a lot of the city in a small amount of time as well as learn a little bit of history as well. Boston Duck Tours and Old Town Trolley Tours are probably the two biggest tour companies in Boston. The Boston Duck Tours will go on land and water where you can hop on and off the Old Town Trolley and see things on bus and foot at your leisure. Ticket prices for both tours are similar, although Old Town Trolley tours are hop and off so you can spend as much or little time as you want on the bus. Tickets through Viator are full-price ($43.48/per adult) BUT new users/new e-mail subscriber can sometimes get special offers like 10% off your first purchase at Viator (there should hopefully be a pop offer when you click the link with special discount) or you can get a free $10 credit if you sign up through a referral link. Tickets through Viator are full-price ($41.95/per adult) BUT new users/new e-mail subscriber can sometimes get special offers when you sign up or receive a pop up with promo code or you can get a free $10 credit if you sign up through a referral link. There are also a lot of other tours (like Fenway Park) that are great options to see during your trip! Boston Children’s Museum offers $1 admission (almost free!) from 5-9pm every Friday night thanks to Target! U.S.S. Constitution: The U.S.S. Constitution Museum is free (with suggested donation for $5-10 per adult) and guided tours of the boat are free. Commonwealth Museum is free during open hours Monday-Friday 9-4:45pm and open seasonally 9-3 on the weekends from May to October. Waterworks Museum is free during open hours which vary depending on season. Also, Boston Library Cardholders can receive discount and free admission to some of Boston’s best museums including the Museum of Science and New England Aquarium. Any Massachusetts residents can get a free Boston Library card but make sure to make your reserve your museum pass in advance especially for the more popular passes. Bank of America cardholders can also receive free admission to select museums the first weekend of every month with the Museums on Us program and military members can receive free admission to many museums through Blue Star Museums from Memorial Day to Labor Day. If you are looking for ways to save on event tickets and tourist attractions, you may want to check out Goldstar Boston and Viator. Goldstar has a good variety of event tickets, cruises, tours, attractions, and more and all their tickets are half off or more! Viator is a great option for booking attractions ahead of time. You may not find a discount on every attraction; however, if you are a new customer, you can receive a free $10 credit when you sign up with a referral code (that’s mine– thank you!). There is also the Go Boston Card and Boston CityPASS which are bundle attraction cards which gives you a discount for a lot of different Boston attractions. These cards are great if you like to see a lot of attractions in a little amount of time. Make sure to read Is the Boston Go Card Worth it? and Is the Boston CityPASS Worth it? for complete breakdown of the cards to see if it’s worth it for you. Daily deal sites like LivingSocial and Groupon are also great to check out for discount tickets for fun things to do and eat in the city to help save more money. Is the Boston CityPASS Worth it? Hope you have a great trip to Boston! Please let me know in the comments below if you have any questions. Thanks! Really? Hm, it was working the other week. Are you a new or existing user? I think it may only work for new users, but I will check! My family is moving to Boston soon, so I’m going to keep this guide handy. Thanks! Tips on where to park or on where to park and take a bus to the tourist traps would be helpful. Hi Richard, It depends on where your staying for the best place to park. I like using parking apps like SpotHero or ParkingPanda that show the parking rates in real time. The Boston Common parking garage is also very central and has a lot of spots so it’s usually a safe bet. I’ll be updating this post soon and will be adding a transportation section so stay tuned! Yes, if you arrive at the airport and take the MBTA silver line, you will not be charged. As long as you stay underground, you can switch to another line and won’t need to pay. You do need to pay getting to the airport, as only leaving the airport is free. Also, it is not free at other silver line locations and only at the airport. Just keep in mind that it may logistically be hard to get to the airport each day from your hotel depending on where you stay and you may still need to take a taxi or shuttle to the airport. Airport hotels are great for a 1 or 2 night stay but if you are staying for longer visit, I’d encourage you to get a hotel downtown. The process of getting into the city from the Airport can take awhile (the Silver Line is slow) and take up valuable vacation time. The Charlie Card is a good idea if you do plan on staying near the Airport for a few days, especially since there’s 6 of you, and it is free. Just stop at South Station near the beginning of your trip. We are also a family of 6 going to Boston in about 3 weeks. We are staying in an Airbnb in Arlington. Is Uber the best way to get us from the airport to our house? Probably Uber or Lyft would be easiest, but I’d ask your AirBnB host what they suggest. Went to MA and Boston for the first time and this guide was so helpful. Thank you! We loved Boston! Great city, great state! Great guide! Thank you Val! Glad you had a great trip! Any chance of getting accommodation/sleeping area for less than $10/day from 19 – 23 Jan? Not likely, unless you find a couch to sleep on or use hotel points.